2007 November 1. Is the ocean carbon sink sinking? RealClimate website. --David. Excerpt: The past few weeks and years have seen a bushel of papers finding that the natural world, in particular perhaps the ocean, is getting fed up with absorbing our CO2... evidence that the hypothesized carbon cycle positive feedback has begun. ...If changing climate were to cause the natural world to slow down its carbon uptake, or even begin to release carbon, that would exacerbate the climate forcing from fossil fuels: a positive feedback. The ocean has a tendency to take up more carbon as the CO2 concentration in the air rises, because of Henry's Law, which states that in equilibrium, more in the air means more dissolved in the water. Stratification of the waters in the ocean, due to warming at the surface for example, tends to oppose CO2 invasion, by slowing the rate of replenishing surface waters by deep waters which haven't taken up fossil fuel CO2 yet. ...The warming at the end of the last ice age was prompted by changes in Earth's orbit around the sun, but it was greatly amplified by the rising CO2 concentration in the atmosphere. The orbits pushed on ice sheets, which pushed on climate. The climate changes triggered a strong positive carbon cycle feedback which is, yes, still poorly understood. Now industrial activity is pushing on atmospheric CO2 directly. The question is when and how strongly the carbon cycle will push back. 2006 December 27. Head-banging snakes may predict China quakes. Excerpt: BEIJING (Reuters) - China has come up with an earthquake prediction system which relies on the behavior of snakes, state media said on Thursday, two days after two quakes struck off neighboring Taiwan. The earthquake bureau in Nanning, capital of the Guangxi autonomous region in southern China, had developed its system using ... snakes at local snake farms via video cameras linked to a broadband Internet connection. The video feed runs 24 hours per day. "Of all the creatures on Earth, snakes are perhaps the most sensitive to earthquakes," bureau director Jiang Weisong was quoted as saying. Jiang said snakes, a popular restaurant dish in the south in the winter, could sense an earthquake from 120 km (70 miles) away, three to five days before it happens. They respond by behaving strangely. "When an earthquake is about to occur, snakes will move out of their nests, even in the cold of winter," Jiang was quoted as saying. 2006 November 21. HISTORIC VOLCANIC ERUPTION SHRUNK THE MIGHTY NILE RIVER. From NASA Earth Observatory. Volcanic eruptions in high-latitudes can greatly alter climate and distant river flows, including the Nile, according to a recent study funded in part by NASA. 2006 November 8. NEW RESEARCH REVEALS HIDDEN EARTHQUAKE TROUBLE SPOTS. From NASA Earth Observatory. A team of scientists has developed a technique to reveal earthquake-prone faults in forested mountainous regions. 2006 October 3. Novarupta. [NASA@Science] In June 1912, Novarupta-one of a chain of volcanoes on the Alaska Peninsula-erupted in what turned out to be the largest blast of the twentieth century. ...Novarupta ...expelled three cubic miles of magma and ash into the air, which fell to cover an area of 3,000 square miles more than a foot deep. .... Novarupta is near the Arctic Circle and its impact on climate appears to be quite different from that of "ordinary" tropical volcanoes, according to recent research by climatologists using a NASA computer model. When a volcano anywhere erupts, it does more than spew clouds of ash, which can shadow a region from sunlight and cool it for a few days. It also spews sulfur dioxide. If the eruption is strongly vertical, it shoots that sulfur dioxide high into the stratosphere more than 10 miles above Earth. ...sulfur dioxide reacts with water vapor to form sulfate aerosols. Because these aerosols float above the altitude of rain, they don't get washed out. They linger, reflecting sunlight and cooling Earth's surface. This can create a kind of nuclear winter (a.k.a. "volcanic winter") for a year or more after an eruption. In April 1815, for instance, the Tambora volcano in Indonesia erupted. The following year, 1816, was called "the year without a summer," with snow falling across the United States in July. Even the smaller June 1991 eruption of Pinatubo in the Philippines cooled the average temperature of the northern hemisphere summer of 1992 to well below average. But both those volcanoes as well as Krakatau were in the tropics. Novarupta is just south of the Arctic Circle. ...NASA GISS climate model showed that aerosols from an arctic eruption such as Novarupta tend to stay north of 30¼N-that is, no further south than the continental United States or Europe. ...This bottling up of Novarupta's aerosols in the north would make itself felt, strangely enough, in India. According to the computer model, the Novarupta blast would have weakened India's summer monsoon, producing "an abnormally warm and dry summer over northern India," says Robock. ...Do Indians need to keep an eye on Arctic volcanoes? The GISS computer says so. February 2005. Living in Earthquake Country. DLESE Teaching Box about how and why earthquakes cause damage. Explores seismic waves, the ability of scientists to predict the likelihood and severity of earthquakes at specific locations, the difference between magnitude and intensity, the occurrence of earthquakes along patches of planar faults, and the potential damage caused by earthquakes such as landslides, liquefaction, or structural failure. 29 November 2005. Mount St. Helens' Quiet Eruption. By KENNETH CHANG, NY Times. Excerpt: The satellite trucks and news reporters have long gone. The crowds of tourists have thinned. No plumes of steam and ash have risen above Mount St. Helens for nine months. Daniel Dzurisin, a volcanologist at the United States Geological Survey's Cascades Volcano Observatory in Vancouver, Wash., said that people often asked him when St. Helens would erupt again. "When I tell them it's erupting today, they're surprised," Dr. Dzurisin said. The mountain has a split personality. The cataclysmic eruption on May 18, 1980, blew off the top 1,300 feet of the mountain, flattened thousands of acres of forest and killed 57 people. The current eruption, now in its 15th month, is quiet, as volcanic eruptions go. It shows no signs of turning violent - no explosions, no ash thrown into the sky. There is not even lava. Instead, what is coming out of the ground is a tube of rock that, while still hot, solidified perhaps half a mile underground and then was pushed upward. The process is somewhat like holding a toothpaste tube vertically and squeezing the toothpaste out. Each second, about a cubic yard of new mountain - roughly a pickup truck's worth - is pushed to the surface, adding to a dome growing inside the crater. In early months of the eruption, the cylinder of new rock, which is about 200 yards in diameter, toppled to the side as it rose. Now, the new rock is buried beneath earlier material and just pushes up the entire hill. 24 May 2005. Post-Tsunami Earthquakes Rumbled Around the Globe. NY Times. By KENNETH CHANG. Excerpt: The shock waves from December's giant earthquake set off devastating tsunamis. They also set off a series of tremblors nearly 7,000 miles from the epicenter in the Indian Ocean. One hour after the earthquake struck off the Indonesian island of Sumatra on Dec. 26, seismometers that keep watch over Mount Wrangell in Alaska recorded an unusual pattern: 14 earthquakes over 11 minutes. The small quakes, up to magnitude 2.0, coincided with a train of shock waves from Sumatra. ..Mount Wrangell shuddered. "Pulsing, if you will, in sync with the waves from Sumatra," said Dr. Michael E. West, a seismologist at the Alaska Volcano Observatory. Mount Wrangell is a huge 14,000-foot-high volcano - "It has little pimples on the side of it that are the size of Mount St. Helens," ...The findings by Dr. West and his colleagues appear in the current issue of the journal Science, ...describing the earthquake, which ruptured more than 800 miles of the sea floor in the eastern Indian Ocean. The earthquake started about 180 miles south of Banda Aceh, the hard-hit city on Sumatra, and the fault broke to the north-northwest. At first, the fault broke relatively slowly for an earthquake: 2,000 miles per hour. At a bend in the fault to the west of Banda Aceh, the breakage sped up to 5,000 to 6,000 m.p.h. and continued to the Nicobar Islands. The shaking lasted 10 minutes. North of the Nicobar Islands, hundreds of miles of the fault also slipped, but the slippage occurred so slowly, an hour or longer, that it did not generate seismic waves as it tilted and lifted the Andaman Islands. ...The largest earthquake ever recorded was a magnitude 9.5 earthquake in Chile in 1960. 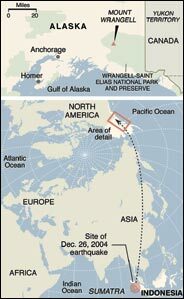 A magnitude 9.2 earthquake occurred in Alaska in 1964. But the Sumatra earthquake "is the longest rupture we've ever seen," said Dr. Roger Bilham, a professor of geological sciences at the University of Colorado.... Dr. Bilham calculated that the movement, pushing the Indo-Australian tectonic plate up to 50 feet beneath the Eurasian plate, reduced the size of the Indian Ocean enough to raise sea level by 0.5 millimeters globally, and the quake released the energy equal to a billion tons of TNT. The shock waves, with wavelengths of hundreds of miles, traveled around the world, lifting and dropping the earth's rocky crust by at least half an inch. Vibrations of the entire earth, ringing like a bell, continued for days and weeks afterward. Twenty years ago, seismologists doubted that an earthquake, even a large one, could unhinge a distant fault. Then, in 1992, an earthquake with a magnitude of 7.3 in Landers, Calif., was followed by a series of small earthquakes in Mammoth Lakes, Calif., nearly 300 miles away, and at Yellowstone National Park, 800 miles away. ... Now, with Sumatra, "This tells us that earthquake triggering can happen on a global scale," Dr. West said. "We're learning the earth is a far more connected place than we once thought it was." Also view map here. 20 May 2005. Tsunami-causing quake has astounded scientists. TEMBLOR LASTED 3 HOURS, CREATED LONGEST KNOWN RUPTURE. By Glennda Chui at gchui@mercurynews.com or (408) 920-5453. Mercury News. The rupture started like a freight train, then slowed to the pace of a snail. The violent shaking lasted 10 minutes, compared to eight seconds for the Loma Prieta quake. And it set off a swarm of tiny earthquakes 6,800 miles away in Alaska. While the world has focused on the deadly tsunami it triggered, researchers have been unearthing the stunning facts behind December's Sumatra-Andaman earthquake. It lasted longer than any quake ever recorded -- up to three hours. It ripped along more than 800 miles of fault, creating the longest known fault rupture. Some researchers think the quake's official magnitude should be raised from 9.0 to 9.3, which would make it the second most powerful quake ever recorded on seismometers. It released up to three times more energy than previously thought -- as much energy as the United States uses in six months, the equivalent of a 100-gigaton bomb. Yet strangely enough, only one-third of that energy was released during the first 10 minutes of the quake, as the fault unzipped at speeds of up to 6,700 mph. ...The quake set the whole Earth ringing like a bell. ``It's still resonating now, after this enormous kick in the teeth,'' said Roger Bilham, a geophysicist at the University of Colorado and author of one of the reports. 9 May 2005. Yellowstone Rated High for Eruption Threat. By THE ASSOCIATED PRESS. YELLOWSTONE NATIONAL PARK, Wyo. (AP) -- The Yellowstone caldera has been classified a high threat for volcanic eruption, according to a report from the U.S. Geological Survey. Yellowstone ranks 21st most dangerous of the 169 volcano centers in the United States, according to the Geological Survey's first-ever comprehensive review of the nation's volcanoes. Kilauea in Hawaii received the highest overall threat score followed by Mount St. Helens and Mount Rainer in Washington, Mount Hood in Oregon and Mount Shasta in California. Kilauea has been erupting since 1983. Mount St. Helens, which erupted catastrophically in 1980, began venting again in 2004. Those volcanoes fall within the very high threat group, which includes 18 systems. Yellowstone is classified with 36 others as high threat. Recurring earthquake swarms, swelling and falling ground, and changes in hydrothermal features are cited in the report as evidence of unrest at Yellowstone. ...University of Utah geology professor Robert Smith, who monitors earthquakes and volcanic activity in Yellowstone, said more real-time monitoring should be helpful. ''We've really been stressing over the last couple of years that the USGS should consider hazards as a very high priority in their future,'' he said. ... The university has joined the Geological Survey and Yellowstone National Park in creating the Yellowstone Volcano Observatory, which uses ground-based instruments throughout the region and satellite data to monitor volcanic and earthquake unrest in the world's first national park. ...Emissions of toxic gases from the park's geothermal features also pose a threat. Five bison dropped dead last year after inhaling poisonous gases trapped near the ground due to cold, calm weather near Norris Geyser Basin. ...Forty-five eruptions, including 15 cases of notable volcanic unrest, have been documented at 33 volcanoes in the U.S. since 1980, according to the report, released April 29. October 2004. Mount St. Helens VolcanoCam provides static images of the volcano as viewed from the Johnston Ridge Observatory. Also, the U.S. Geological Survey maintains a site with updates and current activity at USGS/Cascades Volcano Observatory where links to news and current activity can also be found. 12 October 2004. St. Helens' Hot Spots -- NASA Image of the Day, MODIS and Aster imagery from JPL. 6 October 2004. NASA Infrared Images May Provide Clues About Mt. St. Helens' Eruption. One day before Mt. St. Helens erupted Oct. 1, in southern Washington, NASA scientists took infrared (IR) digital images that revealed signs of heat below the mountain's surface. The images may provide valuable clues as to how the volcano erupted. Scientists flew an infrared imaging system aboard a small Cessna Caravan aircraft over the mountain to acquire the IR data. "Based on the IR signal, the team predicted an imminent eruption," said Steve Hipskind, acting chief of the Earth Science Division at NASA Ames Research Center, located in California's Silicon Valley. 4 October 2004. NASA RELEASE : 04-332, NASA Infrared Images May Provide Volcano Clues -- NASA scientists took infrared (IR) digital images of Mount Saint Helens' last week. The images revealed signs of heat below the surface one day before the volcano erupted last Friday in southern Washington. The images may provide valuable clues as to how the volcano erupted. 3 October 2004. Bigger Eruption Predicted at Mount St. Helens. By SARAH KERSHAW, NY Times. Scientists monitoring Mount St. Helens, which erupted with a minor explosion on Friday, said that they were expecting a more powerful explosion within a day or so. 1 October 2004. NASA Looks Back as Mount St. Helens Trembles Again. After days of small earthquakes and warnings from scientists, a cloud of steam and ash escaped out of the top of Mount St. Helens in Washington today. Scientists don't expect the current activity to approach the magnitude of the 1980 eruption, which blew off the north side of the volcano and deposited ash over 250 miles away. Also... Mt. St. Helens animation that takes you on a 360 degree spin around the volcano. (3.63 MB) and...MT. ST. HELENS OVER TIME. The explosion of Mount St. Helens in 1980 sets the scene for one of Landsat's most important capabilities. As a means for archiving surface features, researchers can study how the Earth changes over time. In this sequence, pictures of the mountain taken in 1973, 1983, and 2000 show how the eruption changed the surrounding area and how the north face of the mountain dramatically changed following the blast. Global Seismographic Network (GSN) -- http://www.iris.edu/about/GSN/ -- to deploy over 128 permanent seismic recording stations uniformly over the earth's surface. Earthquake Facts and Earthquake Fantasy, USGS. 25 June 2004. NASA RELEASE : 04-206 -- New Software On NASA Spacecraft Monitors Active Volcano -- Software on a NASA spacecraft recently made a scientific observation on its own without human interaction. The Space Technology 6 Autonomous Sciencecraft Experiment captured images of Antarctica's Mount Erebus and detected volcanic activity. March 2004. Clickable World Earthquake Map -- click on a particular earthquake for complete information. Distinguish between greater and less than 5.0 magnitude quakes and find links to past and historical quakes. 4 December 2003 NASA RELEASE: 03-390. Progress, Promise In Space-Based Earthquake Research. Nearly 10 years after Los Angeles was shaken by the devastating, magnitude 6.7 Northridge earthquake, scientists at NASA and other institutions say maturing space-based technologies, new ground-based techniques and more complex computer models are rapidly advancing our understanding of earthquakes and earthquake processes. ENGINEERING FOR EARTHQUAKES Build bridges online and run an earthquake simulation to test them for stamina against earthquakes in the Bay Area! Designed for middle-schoolers, the material includes discussion of plate tectonics and how earthquakes happen. The site is built around the damage that was inflicted on the San Francisco-Oakland Bay Bridge during the 1989 earthquake, and you can get a look at the design for the bridge's successor. SQUEEZING WATER FROM ROCK Survivors of the New Madrid, Missouri earthquakes of 1811 reported not only intense ground shaking and land movement, but also an unfamiliar phenomenon: water and sand spouting up through fissures, or cracks, in the Earth's surface. Modern earthquake researchers refer to this expulsion of water and sand from the ground as earthquake dewatering, which results from liquefaction. 11 December 2002. New Scientist -- Earth's volcanism linked to meteorite impacts. Large meteorite impacts may not just throw up huge dust clouds but also punch right through the Earth's crust, triggering gigantic volcanic eruptions. The idea is controversial, but evidence is mounting that the Earth's geology has largely been driven by such events. This would also explain why our planet has so few impact crater remnants.